If you haven't got any principles, how do you know what you're doing is Taiji? 1) The head should be held upright, as if suspended by a thread from the heavens attached to the crown. Thus the spirit (shen) can reach the crown of the head, which should feel light and sensitive, and the spine will be continually stretched and lengthened. 2) Sink and relax the chest: raise and widen the back. Sinking the chest sinks qi to the dantian. Opening the back frees the spine. 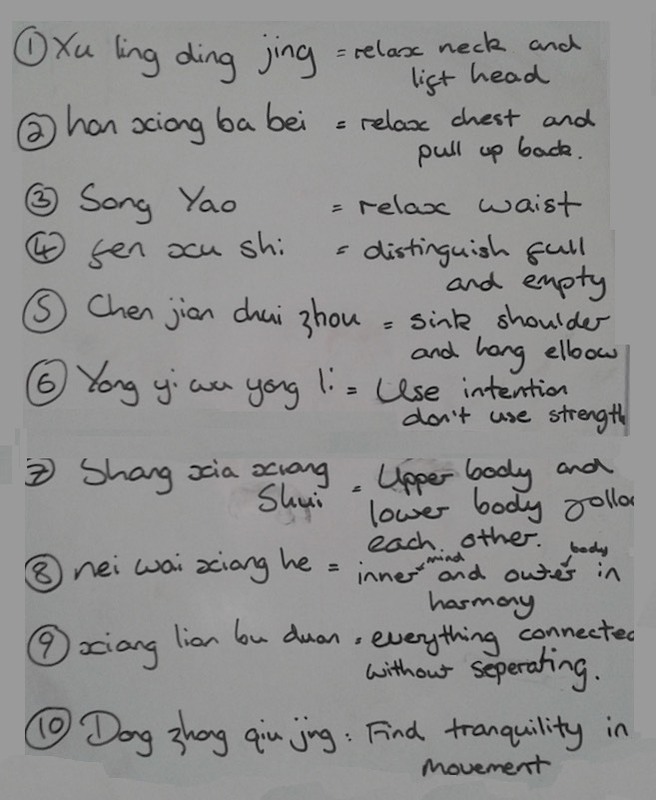 3) Relax and soften the waist so that it turns freely. Turning the waist (Dantian) directs the body and controls the changes between substantial and insubstantial. 4) Clearly differentiate between full and empty, between substantial and insubstantial. Single weightedness allows proper control of balance and movement. 5) Sink the shoulders and elbows. Sinking the shoulders and elbows helps to lower the centre of gravity, sink the qi to the dan tian and thus increase power. 6) Use Mind not force. Softening, relaxing and stretching the whole body without force or tension allows the meridians to be unblocked and the qi to flow without obstruction and to follow the mind so that with practice true internal power can be realised. 7) Co-ordinate upper and lower. Movements are rooted in the feet, issued through the legs, controlled by the waist, transmitted by the spine and manifest in the hands; Feet, waist and hands move together with the eyes. 8) Harmonize the Internal and External. The spirit (shen) leads the body: raise the spirit for light and nimble movement. The mind and the body should do the same thing at the same time. 9) Continuity without interruption, mutually joined and unbroken. 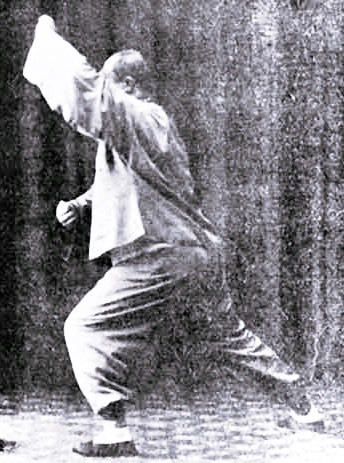 Tai Chi is complete and continuous, circular, unbroken and unending, like the great river flowing to the sea. 10) Seek stillness in movement. When practising, in general the slower the better: the qi sinks to the dan tian, breathing becomes long and slow, the pulse remains constant and the mind is quietened.